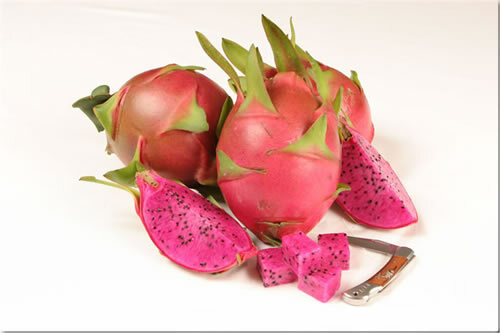 Tricia is a Dragon Fruit variety developed by Edgar Valdivia, a member of the California Fare Growers Association. It was named after one of his daughters. It is a cross between Hylocereus polyrhizus and a Hylocereus ocamponis and has nearly identical characteristics to the Hylocereus ocamponis. The plant is a strong grower with interesting greyish green stems. The gray coating on the stem help protect the plant from the heat in the summer time and cold in the winter time. These stems are very long thick three sided segments with large spines. Flower budding to flower is 30 days and another 30 days from flower to fruit. When flowering the blooms are very impressive with bright colors and extra-large up to 15 inches in diameter. Once mature the plant flowers during the summer time. The variety is not self-pollinating so it will need help with hand pollination. It is also not self-fertile so it will need pollen from another variety. Once pollinated the fruit is a good size with an average weight of one pound. The fruit is egg shaped with a unique look to it having many small fins. 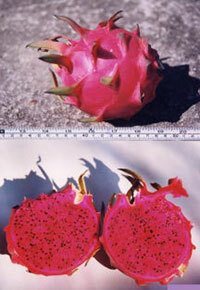 Due to its hybrid crossing the taste of the fruit is different from typical Hylocereus ocamponis. 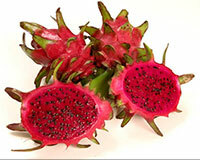 The red fleshed fruit has a nice taste sweetness having no acidity aftertaste. The purple color on the purple dragon fruit indicates that the pigment content level of betalain is so high that it is purple like a beetroot. 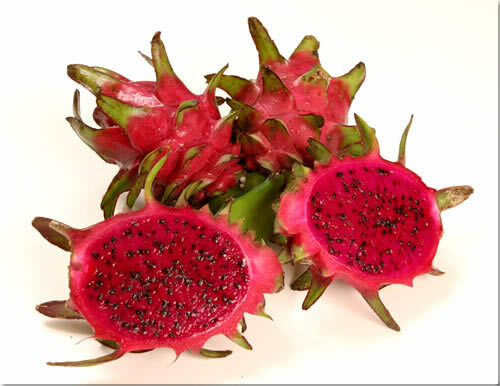 It has the most health benefits of all pitayas. 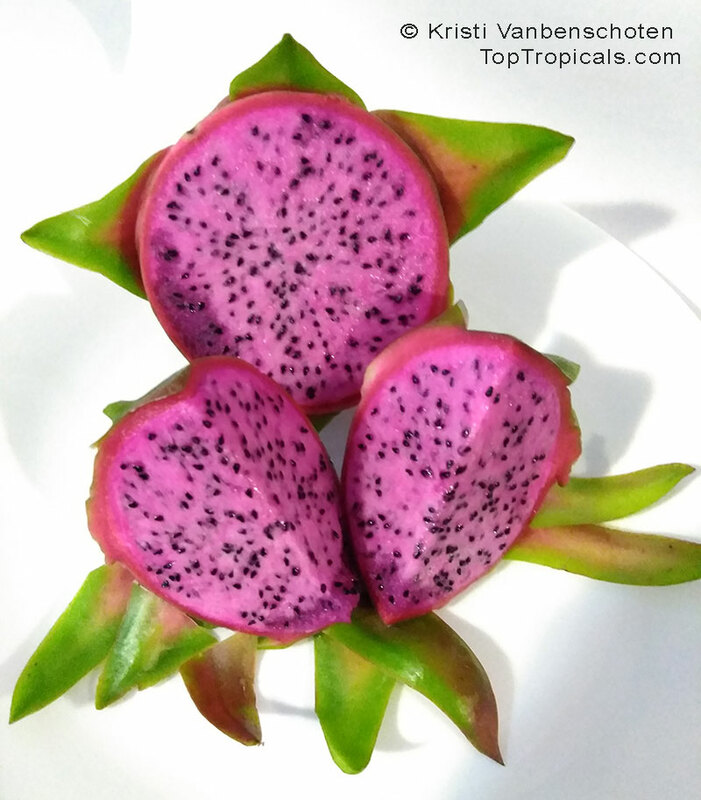 Natural Mystic Dragon Fruit has an amazing watermelon flavor. 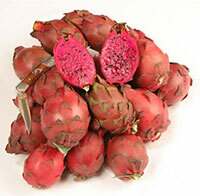 It is a hybrid variety that comes from Hylocereus polyrhizus and Hylocereus undatus. 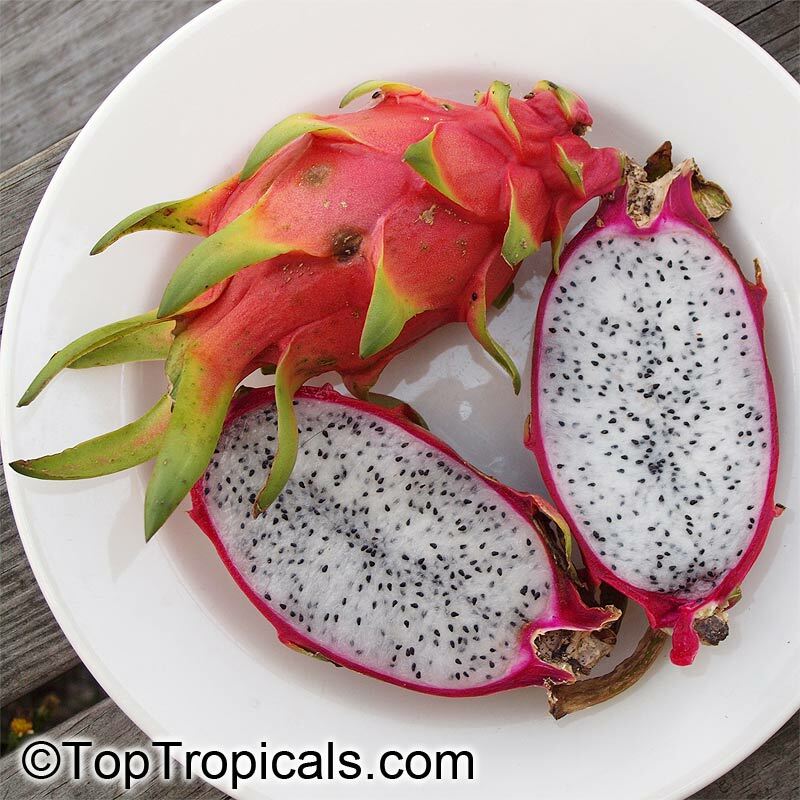 This variety was introduced to Florida by import from Thailand where it is grown small scale commercially in Homestead. 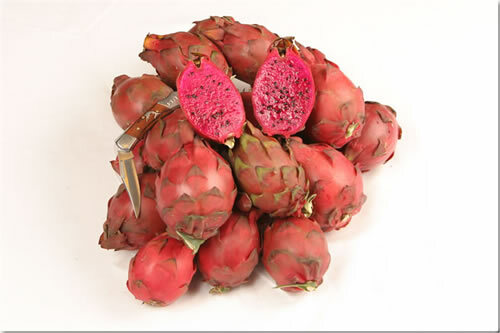 It is a consistent producer of red-fleshed fruit that typically weighs 1 pound. The fruit is very large, and excellent eaten fresh but even better chilled. This variety does not need hand pollination or cross-pollination to set fruit. Once mature it is a heavy producer of flower buds. When flowers appear the pollen it is a great choice for other varieties that do not set fruit on their own. Mature stems have meaty flesh that is three sided and medium-sized spins. The fruit is most often eaten chilled and cut in half so the flesh may be spooned out. The juice is used in frozen drinks and it is in a new Tropicana Twister flavor. It is a must have for any collector or gardener with the flair for the unusual. 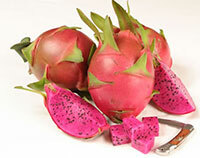 Bloody Mary Dragon Fruit. This variety is very similar in size, color, and taste to Red Jaina. It is not quite as prolific of a producer, but it is nearly indistinguishable beyond that fact. It also needs to be cross pollinated to set fruit. Cosmic Charlie is an excellent self fertile fruit. Like most of the magenta fleshed varieties it has a superb grape, kiwi-like flavor. 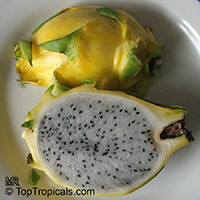 The fruit are medium to large weighing 0.75-1.25 lbs. This variety would be best chilled and eaten out of hand or used as a garnish. Delight is a seedling selection made by the California Rare Fruit Growers. It is a medium to large fruit typically weighing 0.75-1.0 lb. 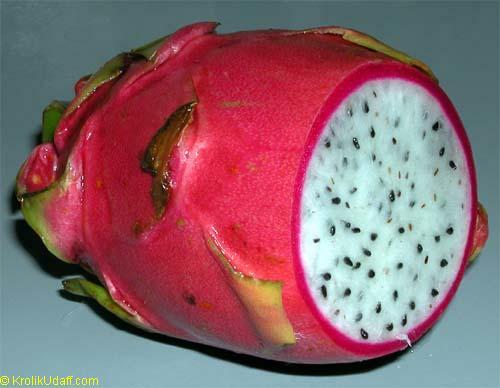 The pulp is sweet with a smooth texture and unique pink hue. It is self pollinating, and it will set fruit without hand pollination. Flavor of the magenta-fleshed fruits is very well balanced, a perfect blend of sweet and tart. Named in honor of the breeder, Edgar Valdivia. 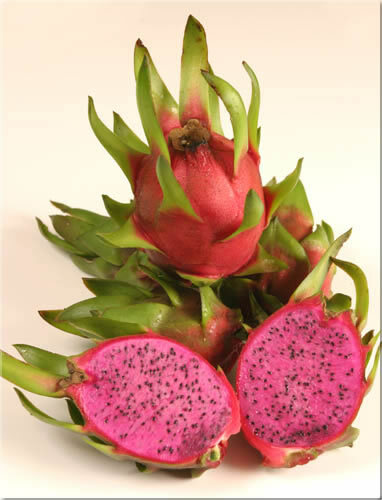 Considered by many to be the best tasting Dragonfruit in the world. Once the vine matures at 4-5’ tall, it begins flowering and fruiting. Fruit ripens four to five weeks after flowering and you can expect successive harvests throughout the summer and fall season. Halleys Comet is a hybrid of a white fleshed and red fleshed fruit. It is incredibly large, typically weighing 1.5-2.0 lbs. The fruit is slightly more rounded than the Physical Graffiti, and the fins are more abbreviated. In all other respects they are nearly identical. 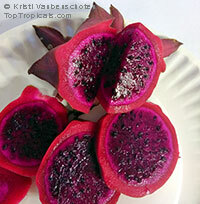 Makisupa is an excellent magenta fleshed fruit with a sweet yet slightly astringent taste. 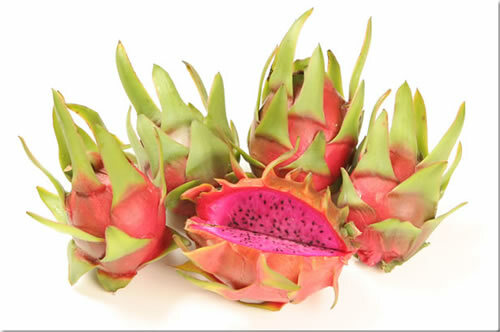 The fruit is attractive having short green fins spindled around the pink surface of the fruit. They are medium to large weighing up to one pound, and this variety is self pollinating. 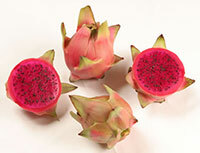 Pitaya is a highly prized, vining, fruit bearing cactus, extremely unusual terrestrial/epiphytic plant. 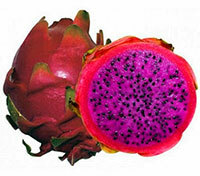 It has magnificent flowers, stunningly beautiful fruit with an intense color, curious shape, and a delicious taste. The night blooming white flowers can be up to 14 inches in length. The fruit is most often eaten chilled and cut in half so the flesh may be spooned out. The juice is used in frozen drinks and it is in a new Tropicana Twister flavor. It is a must have for any collector or gardener with the flair for the unusual. Physical Graffiti is a hybrid of a red fleshed and a white fleshed fruit. The result is a remarkably delicious variety that is both showy inside and out. 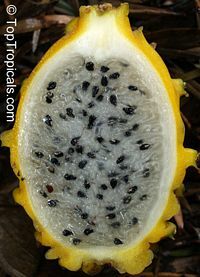 The fruit is large, ranging in size from 0.75-1.5 lbs., and occurs without cross or hand pollination. This variety is certainly worthy of attention by both commercial growers and home owners. Voodoo Child is a small, sangria colored fruit that is exceptionally flavorful. The fruit are slightly larger than an egg, and they have a sweet grape-like taste. They are best chilled and eaten out of hand, or used in combination with other juices. This variety is self pollinating, and it will set fruit on its own. 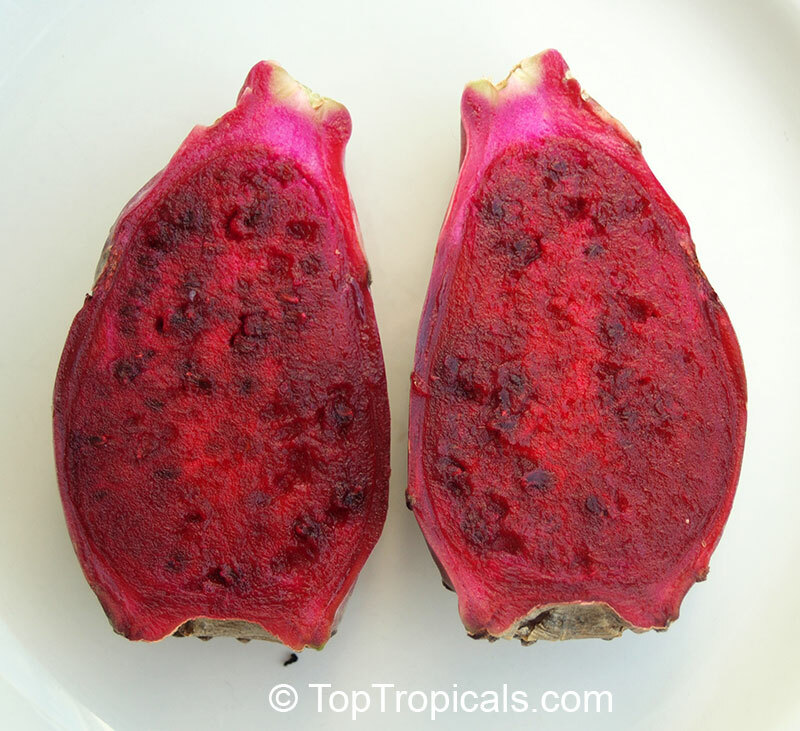 Red Pitaya with white flesh. David Bowie is a slender white variety that has a sweet and tangy flavor that is somewhat lemony. The fruit are medium to large weighing up to a pound. 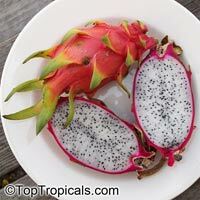 This variety is best eaten fresh, but it would be good for juicing or garnishing as well. It is variety is self pollinating. 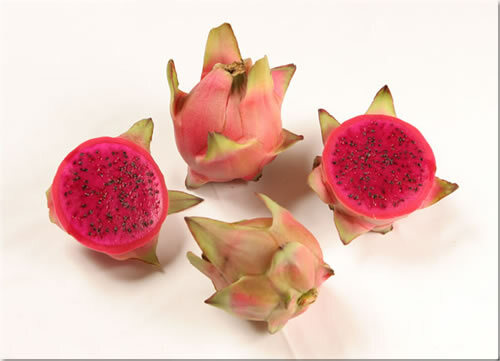 Pitaya is a highly prized, vining, fruit bearing cactus is terrestrial/epiphytic plant which is extremely unusual. It's fleshy stems reach up to 30ft. long, climbing onto walls or over trees using aerial roots. 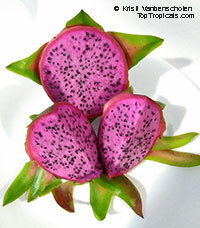 Magnificent flowers, stunningly beautiful fruit with an intense color, curious shape, and a delicious taste. The night blooming white flowers can be up to 14 inches in length. The fruit is eaten chilled and cut in half so the flesh may be spooned out. The juice is used in frozen drinks. It is a must have for any collector or gardener with the flair for the unusual. Zamorano variety was collected from the agriculture university in Honduras for which it is named. It is a medium to large sized fruit typically weighing 0.5-1.0 lbs. The flesh is incredibly dark red and has a sweet mild flavor. Larger fruit size is achieved with hand pollination, but this variety will set fruit on its own. This variety is versatile and can be eaten as fresh fruit, juiced for a drink, or used as a garnish. 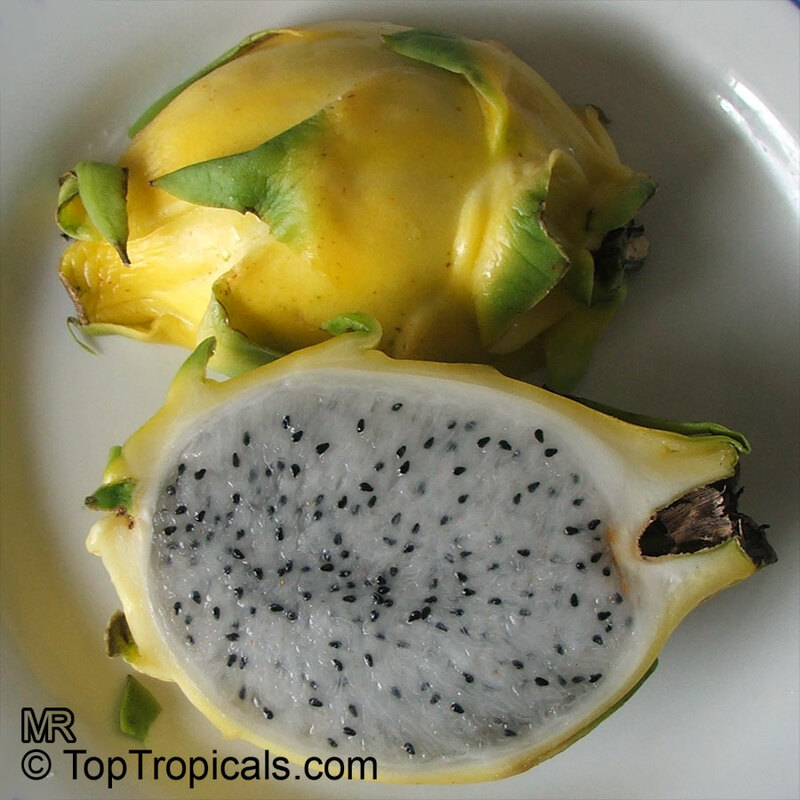 Very rare Yellow Pitaya. This cactus originates from Bolivia, Equador, Peru and Columbia. It's greatly known for it's sweet tasting fruit. Knobbed, yellow cactus fruit sharing some similarities with the Hylocereus dragon fruit (pitaya). 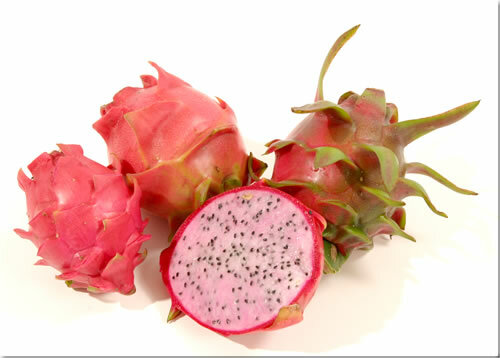 Taste is said to be superior to most cactus fruits. 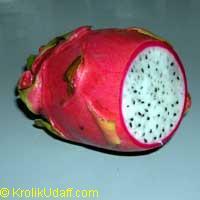 The fruits are smaller than the common dragon fruit, and contain prominent spikes until ripening time, upon which the spikes drop off.